A central notion that is commonly drilled into the brains of undergraduate law and political science students is the separation of powers in the form of the executive, the legislature and the judiciary. We learned that the executive consists of the head of state and the cabinet, the legislature of the parliament and the judiciary of the courts, but there is an arm of the executive that is commonly overlooked in general political discourse – that of the public service as it is known in Australia, or civil service as it is known in the UK. Today we were once again based at The University of Westminster and were fortunate enough to be given a talk by Lord Richard Wilson, former Secretary of the Cabinet and Head of the Home Civil Service. A law graduate from Cambridge, Lord Wilson was an influential member of the UK civil service from 1966 until his retirement in 2002 when he became Master of Emmanuel College, Cambridge until 2012. Despite his impressive political achievements and, in his words, how far Lord Wilson’s “fingerprints” can be seen all over UK policy and political conventions, Lord Wilson showed his humility, openness, and approachability when he insisted that he simply be addressed as Richard. Lord Wilson gave an insightful talk on the inner workings of the UK civil service, the role of the civil service in giving honest advice to MPs and implementing policy, the way in which the civil service interacts with the government of the day, the way in which the civil service prepares for changes in government during election cycles, the rising influence of think tanks and lobby groups in giving policy advice, and the waves of civil service reform which have swept the UK political system since the late 1960s. As well as giving an extremely informative insight into the civil service institutional arrangements, Lord Wilson gave plenty of personal (and rather amusing) anecdotes of his time working as a senior civil servant under both Conservative Prime Minister Margaret Thatcher and “New” Labour Prime Minister Tony Blair. With his frank and honest style, Lord Wilson have us a glimpse behind the scenes of the UK’s political system from where the members of parliament receive their information and where the government’s policy decisions are implemented and actualised. Following on from Lord Wilson’s extremely interesting and insightful talk, the group broke for lunch and some stayed on at the classroom to speak to Clem and John about their upcoming research essays and to pursue any other work related issues. Tomorrow we will be leaving early in the morning to have a couple of sessions at Cambridge. Unfortunately we have had to say goodbye to our logistical coordinator Erika who has been our public transport shepherd, head counter, guide, and friend for the past week. We were all sad to see her go and would like to thank Erika for all of the help she has given us during our first week in London. As the final few days of our study tour roll up, we are all feeling extremely fortunate to have been given the opportunity to learn from so many interesting, well-informed and influential speakers and to have toured locations which have played such an important historical role in shaping both the UK’s and Australia’s political, legal, and cultural institutions. We have also been extremely fortunate to have studied with, collaborated with, and befriended a group of such bright, friendly, and intellectually engaged peers. Let’s see what the rest of our time in London brings. 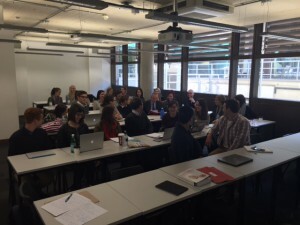 This entry was posted in Events, News, Student and tagged Politics & Law, UK Study Tour 2015. Bookmark the permalink.